Growing: Â Easy to moderate This hybrid marijuana strain is a 90% sativa that has its origins in Thailand It is the result of crossing a pure sativa landrace from Thailand with Star gazer of Delta 9 Labs. Â Pure sativas from Southeast Asia are known to grow tall and takes time in flowering so it was crossed with a high yielder and fast flowering strain like Star Gazer. Â The result is a versatile cannabis strain that can be grown whether indoor and outdoor.Flowering time for Brainstorm Haze can be expected once it reaches 70 days on the average. Â This is already a short period as compared to its original flowering time which takes a lot longer if not crossed with an early flowering strain. 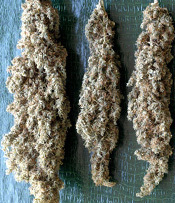 Â It is also expected to give high yield of as much as 600gr/m2 in a normal growing environment. Â The effect when smoked is cerebral with an update, creative and motivating high. I use saved seeds’ every year sometimes, a few years old! If you have a good uonamt of a variety, and want to be sure you end up with a specific number of plants, you can easily test for viability of the seeds. On a piece of damp paper towel on a tray place 10 seeds; cover with plastic wrap or a dish; put in a warm place for a day or so. The uonamt of seeds that sprout will give you the germination rate (for example, if 7 out of ten sprout, you have a 70% average rate of germ.) If the percentage is low, you can just plant 2-3 seeds per cell.You can go to my website plantasiact.com for a seed planting schedule-just go to the Plant Info page. So many positive reviews about this strain I personally heard from friends and acquaintances.Â Iâ€™m not a sativa lover but I might give it a try one day and buy this Brainstorm Haze.